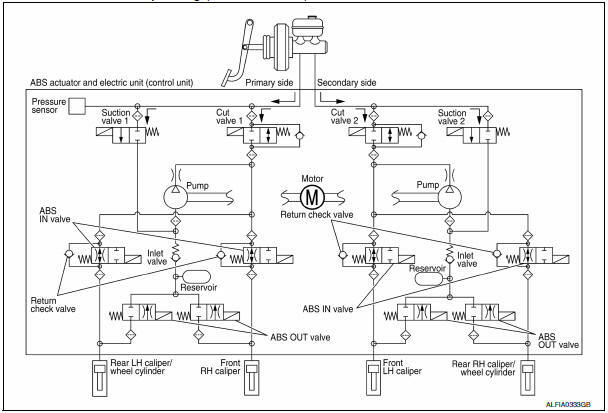 The system switches fluid pressure of each brake caliper and each wheel cylinder to increase, to hold, or to decrease according to signals from control unit in ABS actuator and electric unit (control unit). This control system is applied to VDC, TCS, ABS and EBD functions. Fail-safe function is available for each function and is activated by each function when system malfunction occurs. Major signal transmission between each unit via communication lines is shown in the following table. Steering angle sensor Transmits the steering angle sensor signal to ABS actuator and electric unit (control unit) via CAN communication. 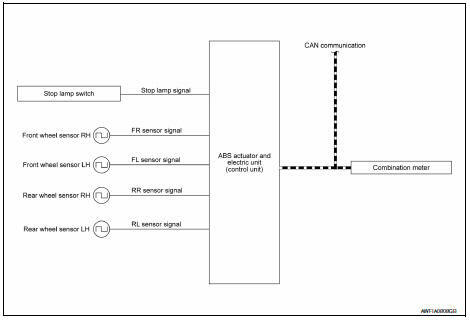 ECM Transmits the following signals to ABS actuator and electric unit (control unit) via CAN communication. TCM Transmits the current gear position signal to ABS actuator and electric unit (control unit) via CAN communication. 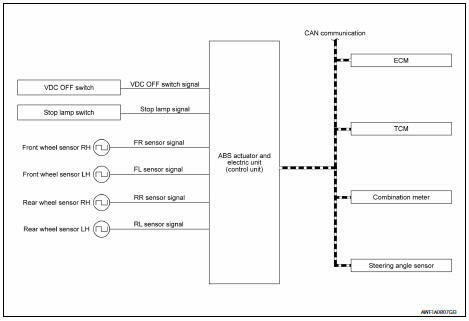 Combination meter Transmits the following signals to ABS actuator and electric unit (control unit) via CAN communication. Receives the following signals from ABS actuator and electric unit (control unit) via CAN communication. The control unit built in the ABS actuator and electric unit (control unit) controls fluid pressure of the brake calipers by operating each valve. Brake fluid is conveyed to the pump from the master cylinder through suction valve 1 and is pressurized by the pump operation. The pressurized brake fluid is supplied to the front RH brake caliper through the ABS IN valve. For the left caliper, brake fluid pressure is maintained because the pressurization is unnecessary. The pressurization for the left caliper is controlled separately from the right caliper. Brake fluid is conveyed to the pump from the master cylinder through suction valve 2 and is pressurized by the pump operation. The pressurized brake fluid is supplied to the front LH brake caliper through the ABS IN valve. For the right caliper, brake fluid pressure is maintained because the pressurization is unnecessary. The pressurization for the right caliper is controlled separately from the left caliper. Brake fluid is conveyed to the pump from the master cylinder through suction valve 2 and is pressurized by the pump operation. The pressurized brake fluid is supplied to the rear RH brake caliper/wheel cylinder through the ABS IN valve. For the left caliper/wheel cylinder, brake fluid pressure is maintained because the pressurization is unnecessary. The pressurization for the left caliper/wheel cylinder is controlled separately from the right caliper/wheel cylinder. 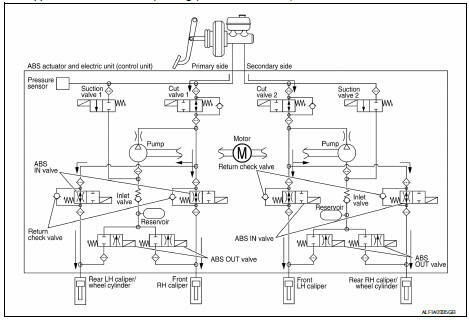 Brake fluid is conveyed to the pump from the master cylinder through suction valve 1 and is pressurized by the pump operation. The pressurized brake fluid is supplied to the rear LH brake caliper/wheel cylinder through the ABS IN valve. For the right caliper/wheel cylinder, brake fluid pressure is maintained because the pressurization is unnecessary. The pressurization for the right caliper/wheel cylinder is controlled separately from the left caliper/wheel cylinder. Since the cut valve 1 and the suction valve 1 are closed, the front RH brake caliper, master cylinder, and reservoir are blocked. This maintains fluid pressure applied on the front RH brake caliper. The pressurization for the left caliper is controlled separately from the right caliper. Since the cut valve 2 and the suction valve 2 are closed, the front LH brake caliper, master cylinder, and reservoir are blocked. This maintains fluid pressure applied on the front LH brake caliper. The pressurization for the right caliper is controlled separately from the left caliper. Since the cut valve 2 and the suction valve 2 are closed, the rear RH brake caliper/wheel cylinder, master cylinder, and reservoir are blocked. This maintains fluid pressure applied on the rear RH brake caliper/wheel cylinder. The pressurization for the left caliper/wheel cylinder is controlled separately from the right caliper/ wheel cylinder. Since the cut valve 1 and the suction valve 1 are closed, the rear LH brake caliper/wheel cylinder, master cylinder, and reservoir are blocked. This maintains fluid pressure applied on the rear LH brake caliper/wheel cylinder. The pressurization for the right caliper/wheel cylinder is controlled separately from the left caliper/ wheel cylinder. Since the suction valve 1 and the ABS OUT valve are closed and the cut valve 1 and the ABS IN valve are open, the fluid pressure applied on the front RH brake caliper is reduced by supplying the fluid pressure to the master cylinder via the ABS IN valve and the cut valve 1. The pressurization for the right caliper is controlled separately from the left caliper. Since the suction valve 2 and the ABS OUT valve are closed and the cut valve 2 and the ABS IN valve are open, the fluid pressure applied on the front LH brake caliper is reduced by supplying the fluid pressure to the master cylinder via the ABS IN valve and the cut valve 2. The pressurization for the left caliper is controlled separately from the right caliper. Since the suction valve 2 and the ABS OUT valve are closed and the cut valve 2 and the ABS IN valve are open, the fluid pressure applied on the rear RH brake caliper/wheel cylinder is reduced by supplying the fluid pressure to the master cylinder via the ABS IN valve and the cut valve 2. The pressurization for the right caliper/ wheel cylinder is controlled separately from the left caliper/wheel cylinder. Since the suction valve 1 and the ABS OUT valve are closed and the cut valve 1 and the ABS IN valve are open, the fluid pressure applied on the rear LH brake caliper/wheel cylinder is reduced by supplying the fluid pressure to the master cylinder via the ABS IN valve and the cut valve 1. The pressurization for the left caliper/ wheel cylinder is controlled separately from the right caliper/wheel cylinder. Pump Returns the brake fluid reserved in reservoir to master cylinder by reducing pressure. 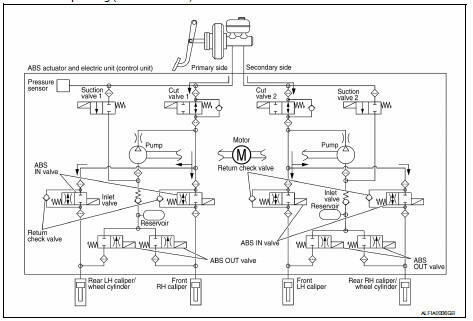 Motor Activates the pump according to signals from ABS actuator and electric unit (control unit). Cut valve 1 Cut valve 2 Shuts off the ordinary brake line from master cylinder. Suction valve 1 Suction valve 2 Supplies the brake fluid from master cylinder to the pump. ABS IN valve Switches the fluid pressure line to increase or hold according to signals from control unit. 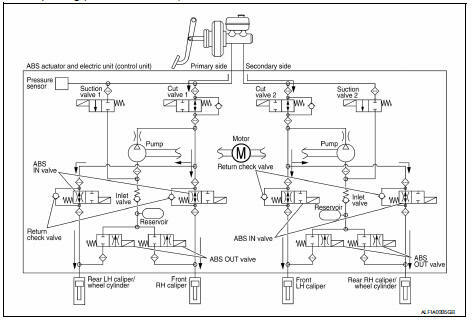 ABS OUT valve Switches the fluid pressure line to increase, hold or decrease according to signals from control unit. Return check valve Returns the brake fluid from brake caliper and wheel cylinder to master cylinder by bypassing orifice of each valve when brake is released. Pressure sensor Detects the brake fluid pressure and transmits signal to ABS actuator and electric unit (control unit). The control unit built into the ABS actuator and electric unit (control unit) controls fluid pressure of the brake calipers by operating each valve. When the cut valve 1 and the ABS IN valve opens, brake fluid is supplied to the front RH brake caliper from the master cylinder through the ABS IN valve. Brake fluid does not flow into the reservoir because the ABS OUT valve is closed. When the cut valve 2 and the ABS IN valve opens, brake fluid is supplied to the front LH brake caliper from the master cylinder through the ABS IN valve. Brake fluid does not flow into the reservoir because the ABS OUT valve is closed. When the cut valve 2 and the ABS IN valve opens, brake fluid is supplied to the rear RH brake caliper/wheel cylinder from the master cylinder through the ABS IN valve. Brake fluid does not flow into the reservoir because the ABS OUT valve is closed. When the cut valve 1 and the ABS IN valve opens, brake fluid is supplied to the rear LH brake caliper/wheel cylinder from the master cylinder through the ABS IN valve. Brake fluid does not flow into the reservoir because the ABS OUT valve is closed. Since the ABS IN valve and the ABS OUT valve are closed, the front RH brake caliper, master cylinder, and reservoir are blocked. This maintains fluid pressure applied on the front RH brake caliper. Since the ABS IN valve and the ABS OUT valve are closed, the front LH brake caliper, master cylinder, and reservoir are blocked. This maintains fluid pressure applied on the front LH brake caliper. Since the ABS IN valve and the ABS OUT valve are closed, the rear RH brake caliper/wheel cylinder, master cylinder, and reservoir are blocked. This maintains fluid pressure applied on the rear RH brake caliper/wheel cylinder. Since the ABS IN valve and the ABS OUT valve are closed, the rear LH brake caliper/wheel cylinder, master cylinder, and reservoir are blocked. This maintains fluid pressure applied on the rear LH brake caliper/wheel cylinder. Since the ABS IN valve is closed and the ABS OUT valve is opened, fluid pressure applied on the front RH brake caliper is supplied to the reservoir through the ABS OUT valve. This fluid pressure decreases when sent to the master cylinder by the pump. Since the ABS IN valve is closed and the ABS OUT valve is opened, fluid pressure applied on the front LH brake caliper is supplied to the reservoir through the ABS OUT valve. This fluid pressure decreases when sent to the master cylinder by the pump. Since the ABS IN valve is closed and the ABS OUT valve is opened, fluid pressure applied on the rear RH brake caliper/wheel cylinder is supplied to the reservoir through the ABS OUT valve. This fluid pressure decreases when sent to the master cylinder by the pump. Since the ABS IN valve is closed and the ABS OUT valve is opened, fluid pressure applied on the rear LH brake caliper/wheel cylinder is supplied to the reservoir through the ABS OUT valve. This fluid pressure decreases when sent to the master cylinder by the pump. Brake fluid is supplied to the front RH brake caliper from the master cylinder through the cut valve 1 and the ABS IN valve. Since the suction valve 1 and the ABS OUT valve is closed, the fluid does not flow into the reservoir. The amount of brake fluid supplied to the front RH brake caliper from the master cylinder is controlled according to time that the ABS IN valve is not energized (time that the ABS IN valve is open). Brake fluid is supplied to the front LH brake caliper from the master cylinder through the cut valve 2 and the ABS IN valve. Since the suction valve 2 and the ABS OUT valve is closed, the fluid does not flow into the reservoir. The amount of brake fluid supplied to the front LH brake caliper from the master cylinder is controlled according to time that the ABS IN valve is not energized (time that the ABS IN valve is open). Brake fluid is supplied to the rear RH brake caliper/wheel cylinder from the master cylinder through the cut valve 2 and the ABS IN valve. Since the suction valve 2 and the ABS OUT valve is closed, the fluid does not flow into the reservoir. The amount of brake fluid supplied to the rear RH brake caliper/wheel cylinder from the master cylinder is controlled according to time that the ABS IN valve is not energized (time that the ABS IN valve is open). Brake fluid is supplied to the rear LH brake caliper/wheel cylinder from the master cylinder through the cut valve 1 and the ABS IN valve. Since the suction valve 1 and the ABS OUT valve is closed, the fluid does not flow into the reservoir. The amount of brake fluid supplied to the rear LH brake caliper/wheel cylinder from the master cylinder is controlled according to time that the ABS IN valve is not energized (time that the ABS IN valve is open). Brake fluid is supplied to the front RH brake caliper through the return check valve of the ABS IN valve and the cut valve 1, and returns to the master cylinder. Brake fluid is supplied to the front LH brake caliper through the return check valve of the ABS IN valve and the cut valve 2, and returns to the master cylinder. Brake fluid is supplied to the rear RH brake caliper/wheel cylinder through the return check valve of the ABS IN valve and the cut valve 2, and returns to the master cylinder. Brake fluid is supplied to the rear LH brake caliper/wheel cylinder through the return check valve of the ABS IN valve and the cut valve 1, and returns to the master cylinder. Reservoir Temporarily reserves the brake fluid drained from brake caliper, so that pressure efficiently decreases when decreasing pressure of brake caliper and wheel cylinder. Turns ON when VDC and TCS functions are switched to non-operational status (OFF) by VDC OFF switch. Turns ON when ignition switch turns ON and turns OFF when the system is normal, for bulb check purposes. Side slip or tail slip may occur while driving on a slippery road or intending an urgent evasive driving maneuver. 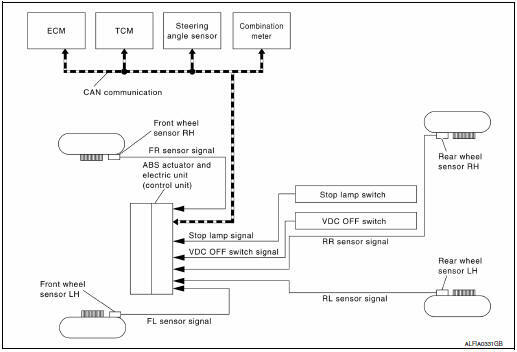 VDC function detects side slip status using each sensor when side slip or tail slip is about to occur and improves vehicle stability by brake control and engine output control during driving. In addition to ABS function, EBD function and TCS function, target side slip amount is calculated according to steering operation amount from steering angle sensor. By comparing this information with vehicle side slip amount that is calculated from information from yaw rate/side G sensor and wheel sensor, vehicle driving conditions (conditions of understeer or oversteer) are judged and vehicle stability is improved by brake force control on all 4 wheels and engine output control. VDC function can be switched to non-operational status (OFF) by operating VDC OFF switch. In this case, VDC OFF indicator lamp turns ON. Brake force control function at braking hard detects driver′s brake operations with the pressure sensor, judges a brake booster′s maximum brake power function by using information from the vacuum sensor, and enhances more powerful braking force by controlling brakes of four wheels. VDC warning lamp blinks while VDC function is in operation and indicates to the driver that the function is in operation. CONSULT can be used to diagnose the system. Fail-safe function is adopted. When a malfunction occurs in VDC function, the control is suspended for VDC function and TCS function. However, ABS function and EBD function operate normally. Refer to BRC-39, "Fail-safe". During cornering, brake force (brake fluid pressure) is applied on front wheel and rear wheel on the outer side of turn. Momentum is generated directing the vehicle toward the outer side of the turn. Oversteer is prevented. Changing driving lane on a slippery road, when there may be a tendency to oversteer, engine output is controlled as well as brake force (brake fluid pressure) of 4 wheels. Oversteer tendency decreases. During cornering, brake force (brake fluid pressure) is applied on front wheel and rear wheel on the inner side of turn. Momentum is generated directing the vehicle toward the inner side of the turn. Understeer is prevented. Applying brakes during cornering on a slippery road, when there may be a tendency to understeer, engine output is controlled as well as brake force (brake fluid pressure) of 4 wheels. Understeer tendency decreases. Wheel spin status of drive wheel is detected by wheel sensor of 4 wheels. Engine output and transmission shift status is controlled so that slip rate of drive wheels is in appropriate level. When wheel spin occurs on drive wheel, ABS actuator and electric unit (control unit) perform brake force control of LH and RH drive wheels (apply brake force by increasing brake fluid pressure of drive wheel) and decrease engine torque by engine torque control. Wheel spin amount decreases. 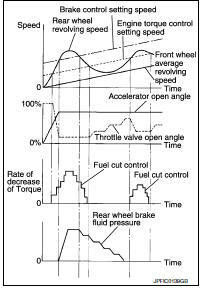 Engine torque is controlled to appropriate level. TCS function can be switched to non-operational status (OFF) by operating VDC OFF switch. In this case, VDC OFF indicator lamp turns ON. SLIP indicator lamp blinks while TCS function is in operation and indicates to the driver that the function is in operation. Fail-safe function is adopted. When a malfunction occurs in TCS function, the control is suspended for VDC function and TCS function. However, ABS function and EBD function operate normally. By preventing wheel lock through brake force (brake fluid pressure) control that is electronically controlled by detecting wheel speed during braking, stability during emergency braking is improved so that obstacles can be easily bypassed by steering operation. During braking, control units calculate wheel speeds, and transmit pressure increase, hold or decrease signals to actuator portion according to wheel slip status. The following effects are obtained by preventing wheel lock during braking. Vehicle tail slip is prevented during braking when driving straight. Understeer and oversteer tendencies are moderated during braking while cornering. Obstacles may be easily bypassed by steering operation during braking. Fail-safe function is adopted. When a malfunction occurs in ABS function, the control is suspended for VDC function, TCS function and ABS function. However, EBD function operates normally. Refer to BRC-28, "VDC/TCS/ABS : Fail-safe". 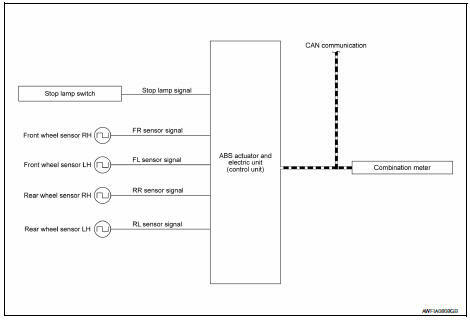 Combination meter Receives the following signals from ABS actuator and electric unit (control unit) via CAN communication. By preventing rear wheel slip increase through rear wheel brake force (brake fluid pressure) control that is electronically controlled when slight skip on front and rear wheels are detected during braking, stability during braking is improved. EBD function is expanded and developed from conventional ABS function and corrects rear wheel brake force to appropriate level by electronic control according to load weight (number of passengers). During braking, control unit portion compares slight slip on front and rear wheels by wheel sensor signal, transmits drive signal to actuator portion when rear wheel slip exceeds front wheel slip for the specified value or more, and controls rear wheel brake force (brake fluid pressure) so that increase of rear wheel slip is prevented and slips on front wheel and rear wheel are nearly equalized. ABS control is applied when slip on each wheel increases and wheel speed is the threshold value of ABS control or less. Fail-safe function is adopted. When a malfunction occurs in EBD function, the control is suspended for VDC function, TCS function, ABS function and EBD function. Refer to BRC-28, "VDC/TCS/ABS : Fail-safe". VDC warning lamp in combination meter turns ON when a malfunction occurs in system [ABS actuator and electric unit (control unit)]. The control is suspended for VDC and TCS functions. However, ABS and EBD functions operate normally. ABS warning lamp and SLIP indicator lamp in combination meter turn ON when a malfunction occurs in system [ABS actuator and electric unit (control unit)]. The control is suspended for VDC, TCS and ABS functions. However, EBD functions operate normally. C1102 When an open circuit is detected in rear LH wheel sensor circuit. C1103 When an open circuit is detected in front RH wheel sensor circuit. C1104 When an open circuit is detected in front LH wheel sensor circuit. When a short circuit is detected in rear RH wheel sensor circuit. When power supply voltage of rear RH wheel sensor is in following state. When distance between rear RH wheel sensor and rear RH wheel sensor rotor is large. When installation of rear RH wheel sensor or rear RH wheel sensor rotor is not normal. When a short circuit is detected in rear LH wheel sensor circuit. 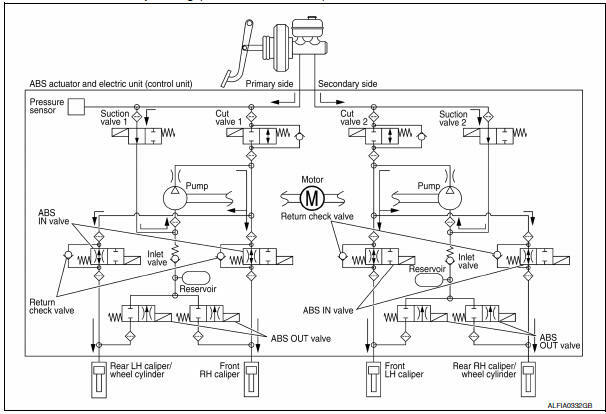 When power supply voltage of rear LH wheel sensor is in following state. When distance between rear LH wheel sensor and rear LH wheel sensor rotor is large. When installation of rear LH wheel sensor or rear LH wheel sensor rotor is not normal. When a short circuit is detected in front RH wheel sensor circuit. When power supply voltage of front RH wheel sensor is in following state. When distance between front RH wheel sensor and front RH wheel sensor rotor is large. When installation of front RH wheel sensor or front RH wheel sensor rotor is not normal. When a short circuit is detected in front LH wheel sensor circuit. When power supply voltage of front LH wheel sensor is in following state. When distance between front LH wheel sensor and front LH wheel sensor rotor is large. When installation of front LH wheel sensor or front LH wheel sensor rotor is not normal. When ignition power supply voltage is in following state. Ignition power supply voltage: 10 V ≥ Ignition power supply voltage. Ignition power supply voltage: 16 V ≤ Ignition power supply voltage. C1110 When there is an internal malfunction in the ABS actuator and electric unit (control unit). C1121 When a malfunction is detected in front LH ABS OUT valve. C1122 When a malfunction is detected in front RH ABS IN valve. C1123 When a malfunction is detected in front RH ABS OUT valve. C1124 When a malfunction is detected in rear LH ABS IN valve. C1125 When a malfunction is detected in rear LH ABS OUT valve. C1126 When a malfunction is detected in rear RH ABS IN valve. C1127 When a malfunction is detected in rear RH ABS OUT valve. C1143 When a malfunction is detected in steering angle sensor. C1144 When neutral position adjustment of steering angle sensor is not complete. C1145 When a malfunction is detected in yaw rate signal, or signal line of yaw rate/side/ decel G sensor is open or shorted. C1146 When a malfunction is detected in side G signal, or signal line of yaw rate/side/decel G sensor is open or shorted. C1165 When a malfunction is detected in cut valve 2. C1166 When a malfunction is detected in suction valve 1. C1167 When a malfunction is detected in suction valve 2. U1002 When ABS actuator and electric unit (control unit) is not transmitting or receiving CAN communication signal for 2 seconds or less. 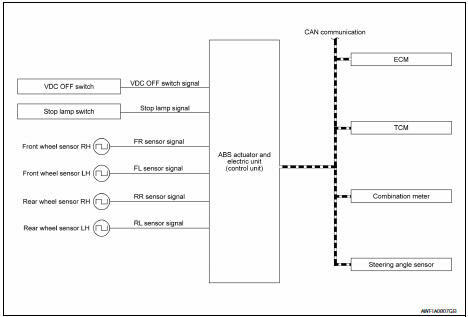 U1010 When detecting error during the initial diagnosis of CAN controller of ABS actuator and electric unit (control unit).